Famous diamonds, historical artwork. Eleven named diamonds arrayed together with four unnamed examples of ordinary diamonds. 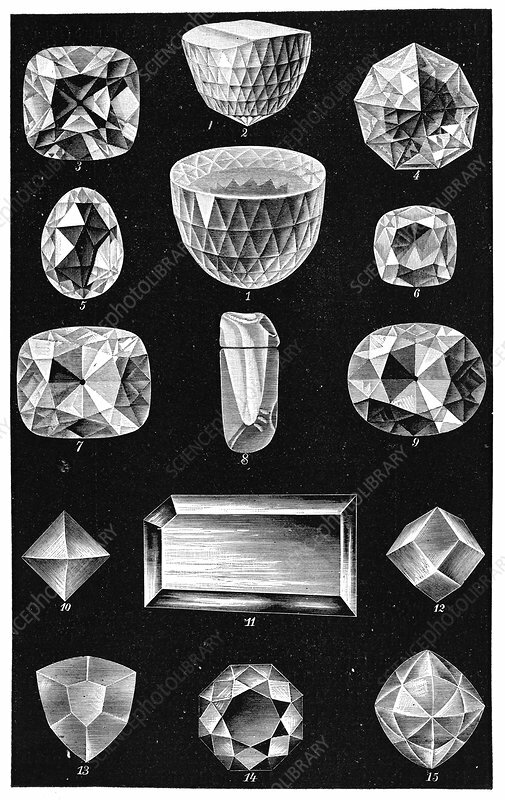 From left to right, from top to bottom, numbered in brackets, these diamonds are: Regent (3); Orlov (2); Florentine (4); Sancy (5); Great Mogul (1); Polar Star (6); Star of the South (7); Shah (8); Koh-i-Noor (9); unnamed (10); Darya-ye Noor (11); unnamed (12); unnamed (13); Pasha of Egypt (14); unnamed (15). Many of the named diamonds are famed for their size and colours. Artwork from the third edition of 'Les Entrailles de la Terre' (1902) by French author Eugene Caustier.